BACKGROUND: In 1868, Nylander described 15 new lichen taxa from collections made near Durban, South Africa. The locality was not specified and the collector was identified only as 'Miss Armstrong'. OBJECTIVES: To identify the collector and type locality of Nylander's species. METHOD: Scientific literature, maps, letters, notebooks and genealogical sources were consulted to reconstruct the provenance of the specimens. RESULTS: 'Miss Armstrong' was likely Olivia Armstrong; she collected in the Karkloof area of the KwaZulu-Natal Midlands. CONCLUSION: This investigation facilitates future work to determine whether the species described and reported by Nylander are still extant in the same locality. In 1868, Finnish taxonomist William Nylander published a short article on lichens collected from 'Port-Natal' (Nylander 1868). This paper identified 84 species and infraspecific taxa, many of which had not previously been reported from southern Africa and 15 of which were new to science. Most of these new species have neither been recorded since their original description nor given a modern taxonomic assessment (Table 1). Nylander's paper was one of the earliest publications to discuss lichens from eastern South Africa (Doidge 1950) and represents his most substantial contribution to South African botany. Nylander was one of the pre-eminent lichenologists of his day; like many other prolific European and American taxonomists of that era, he did little fieldwork and relied on collectors around the world who sent samples for him to identify and describe (Ahti 1990). Nylander's (1868) article includes a sparse provenance for the 'Port-Natal' collections. The specimens came to him by way of the Irish lichenologist Theobald Jones, who received them from a 'Mr Mackenzie'. Mackenzie, in turn, obtained the lichens from a collector identified only as 'Miss Armstrong'. Nylander provides no other information about the collector or collection locality. Subsequent writers have done no better at naming Miss Armstrong. The next reference to her in the scientific literature lists Miss Armstrong and her father ('Dr Armstrong') as collectors with specimens from South Africa and New Zealand in the Kew herbarium (Jackson 1901). In a 1950 historical account of research on fungi in South Africa, Ethel Doidge writes that 'About Miss Armstrong, an early collector of lichens, no details have been found, although several families of that name were resident in Natal in the second half of the 19th century' (Doidge 1950:29). Apparently, no details were uncovered in the following decades, because a 1974 article simply lists 'Dr and Miss Armstrong' among 'other Natalians who contributed collections of Natal plants to overseas herbaria' (Bayer 1974:46). Both editions of Botanical Exploration of Southern Africa include Miss Armstrong and her father. Under the heading 'Armstrong, Dr and Miss', the first edition mentions the collections sent to Kew and Nylander (Gunn & Codd 1981). The second edition provides additional biographical details about Dr Armstrong, but Miss Armstrong is left out of the heading, appearing only in the last line of her father's biography: 'One of his daughters collected with him, but it is apparently not known who' (Glen & Germishuizen 2010:80). The reason for this change is unclear; the one additional reference cited in the second edition says only that 'Dr. Armstrong and one of his daughters are numbered among the early collectors of Natal plants' (Spencer 1983:72). This comment is almost certainly based on Jackson (1901). The initial impetus for the present article was to identify Miss Armstrong and investigate her activities as a botanical collector. However, determining Miss Armstrong's identity also entailed locating the probable area in which she collected. Resolving collection localities from vague or incorrect descriptions in the original literature requires investigation of letters, notebooks and similar sources - the same sort of work necessary for a biographical study. This kind of investigation is particularly important when a species is only known from its type locality - as is the case for a number of the species involved here - because relocating that locality is a first step towards determining the species' current status. The literature cited in the introduction provided a starting point for research into the Armstrong family. A search for additional information on the Armstrong family was conducted in the digitised Pietermaritzburg Archives Repository. Archives associated with Theobald Jones (National Botanic Gardens of Ireland, Glasnevin) and William Nylander (National Library of Finland) were consulted to find letters and notebooks that mentioned Miss Armstrong's collections. Online specimen databases and correspondence with curatorial staff at relevant herbaria (K, H-NYL and DBN) were used to locate specimens. The literature and archival search sheds light on the cast of characters involved in this taxonomic story. A letter from Jones to Nylander (Jones 1866a) explains that 'Mr Mackenzie' acquired the lichens at the request of Jones' cousin Robert Garden, a British soldier and naturalist who was stationed in Pietermaritzburg during the 1850s (Glen & Germishuizen 2010). That letter also alleges that the lichens were collected primarily by a 'Mr Trotter', whose farm was close to Mackenzie's. However, a second letter from Jones to Nylander (Jones 1866b) clarifies that Trotter played no role in the collecting and that it was in fact a 'Miss Armstrong' who collected most of the specimens, with Mackenzie collecting some others. Who, then, was Miss Armstrong - the namesake for the species Lecidea armstrongiae described in Nylander's paper? Spencer (1983) provides some useful details about her family. We know that her father was Dr William Armstrong, who had 11 children, including 6 daughters, with his wife Mary Ann Stevens. The oldest daughter, Mary Jane, died in 1856 before the family left England for South Africa. The remaining daughters were Olivia Wolfenden (b. about 1845), Mary Kathleen (b. about 1850), Ann Kathleen (b. 1854), Amy Jane (b. 1859) and Edith (b. 1862). Miss Armstrong's lichen specimens reached Europe in two shipments in mid- and late 1866 (Jones 1866a, 1866b, 1866c) and were probably collected earlier that year. The three youngest daughters (aged 12, 7 and 4) would have been too young to be collecting lichen specimens for taxonomic study, whereas Mary Kathleen (ca. 16 years old) and Olivia (ca. 21 years old) are both plausible candidates. Jones (1866b) notes that 'Miss Armstrong is a Fern Collector and … also professes some knowledge of Botany'. Given the ages of Olivia and Mary Kathleen, it seems somewhat more likely that Olivia was the one with botanical knowledge, although this is far from certain. Additional circumstantial evidence comes from material published several decades later. Olivia Armstrong married James Thomas Ball in 1872 (Spencer 1983), and, in 1922, Olivia Wolfenden Ball was listed as a member of the South African Association for the Advancement of Science (Anonymous 1922). Although there is no explicit proof that Olivia, rather than Mary Kathleen, was Nylander's 'Miss Armstrong', her age at the time the collections were made and her later interest in science suggest that she is the more probable collector. Olivia Armstrong died on 05 May 1934 in Durban; accompanying the death notice is extensive documentation of a dispute over her will, which unfortunately gives no details about specific possessions that might indicate botanical interests (Pietermaritzburg Archives Repository 1934). The tentative identification of Olivia Wolfenden Armstrong as Nylander's 'Miss Armstrong' also clarifies the locality where the lichens were collected. Rather than being from the Durban area (as the title of Nylander's paper suggests), the specimens are likely from the KwaZulu-Natal Midlands, specifically the Karkloof region north of Pietermaritzburg where the Armstrong family lived (Spencer 1983; Figure 1). That this is the most plausible collection locality is reinforced by the mention in Jones' letters of other individuals - Mackenzie and Trotter - who lived on farms close to the Armstrong family's Rodeborough (Jones 1866a, 1866b; Surveyor General's Office 1904). The 'Mr Mackenzie' who served as an intermediary in Robert Garden's effort to acquire lichen specimens for Jones was almost certainly a William Mackenzie who lived on a nearby farm called Cramond (Shaw 1990). South Africa hosts a diverse lichen biota which is underexplored compared to other groups of organisms in the country (Fryday 2015). In addition to a large number of species, which likely remain undescribed, there are many taxa historically described from the country that are only known from a single collection (Doidge 1950; Fryday 2015). Studies such as the present investigation, which has identified the type locality for about a dozen such species and located the original herbarium vouchers used for the descriptions, are an essential first step in re-evaluating these taxa. 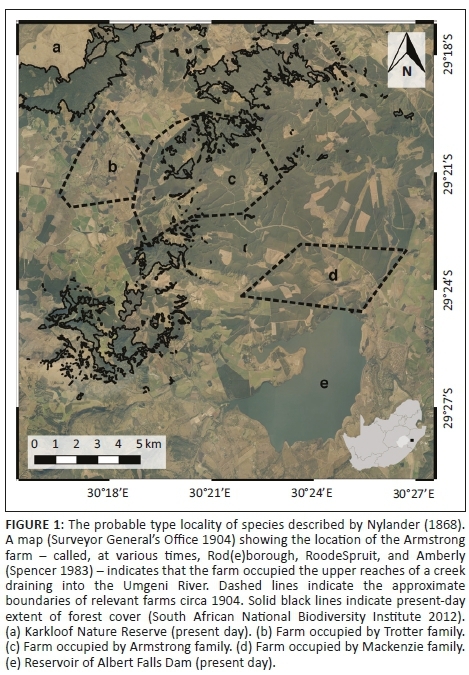 The newly identified locality for the collections treated by Nylander (1868) suggests that the specimens were collected in Southern Mistbelt Forest and Midlands Mistbelt Grassland (Mucina & Rutherford 2006), not in coastal habitats as might be implied by Nylander's original, vague description. 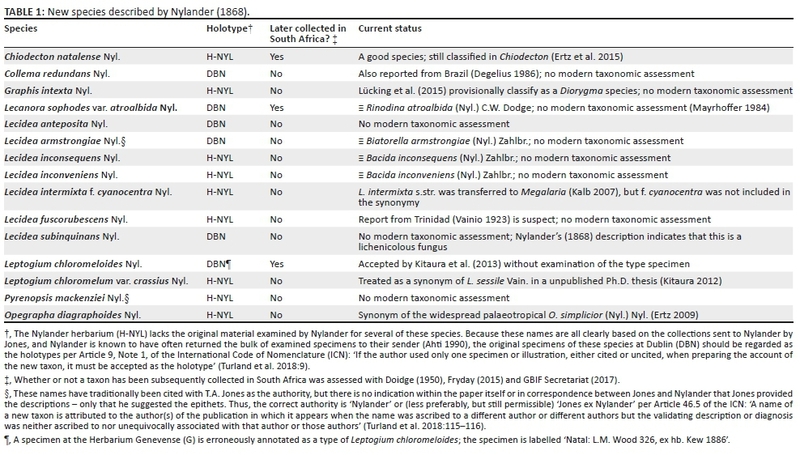 Re-examination of the original specimens at DBN may be sufficient to resolve the taxonomic status of some of Nylander's species (Table 1), but new collections and molecular investigation will probably be necessary for species with poor type specimens or which are morphologically close to species described from elsewhere in the world. The presence of this type material in Dublin has apparently not been previously recognised and the absence of certain holotypes from Nylander's herbarium (H-NYL) has stymied at least one attempt to revise a taxon described by Nylander from this collection (Mayrhoffer 1984). Because there are still forest patches in the collection locality (Figure 1), an attempt to rediscover these species in nature can begin precisely where they were originally found. No record could be found of an 1867 visit to New Zealand by Miss Armstrong or her father. It seems likely that a different collector with the surname Armstrong was active in New Zealand and that Jackson (1901) erred in linking the New Zealand and South Africa collections. This hypothesis is supported by the fact that the Kew herbarium houses a number of New Zealand vascular plant specimens collected in 1867 by Joseph B. Armstrong (Herriott 1919; Appendix 1), an individual not listed by Jackson (1901). Kew specimens also confirm that Dr Armstrong (and possibly Olivia as well) did collect South African plants: at least two specimens collected by someone with the surname Armstrong have the locality 'Rodeborough, Natal' - one name used for Dr Armstrong's farm (Spencer 1983). No other specimens collected by Olivia Armstrong appear in the lichenological literature, suggesting that lichens did not become a major interest for her after her 1866 foray. But Olivia Armstrong and William Mackenzie made an important early contribution to lichen taxonomy in South Africa, providing the source material for dozens of new records for southern Africa and 15 taxa new to science. Some of these species have never been reassessed in light of modern lichen taxonomy, meaning that the specimens Olivia Armstrong collected in the 1860s are still relevant to biodiversity research in South Africa today. Orvo Vitikainen and Leena Myllys (H), Howard Fox (DBN), Craig Brough (K) and Alan Fryday (MSC) are warmly thanked for their help in locating specimens and documents, and Nishanta Rajakaruna and Stefan Siebert are thanked for faciliatating the author's research on South African lichens. Members of the Systematics Discussion Group at Duke University provided useful feedback on an early draft of this article, and two anonymous reviewers are thanked for comments which improved the manuscript. The author is supported by a first-year PhD fellowship from the Duke University Graduate School and a Graduate Research Fellowship from the US National Science Foundation. Note that the search for relevant collections was limited to digitised specimens; not all Kew specimens have been digitised. K000603889: Gleichenia polypodioides (L.) Sm.